NICE has recommended Novartis’ CAR T-cell therapy Kymriah for use, giving patients with relapse or refractory diffuse large B-cell lymphoma (DLBCL) a revolutionary new treatment option. 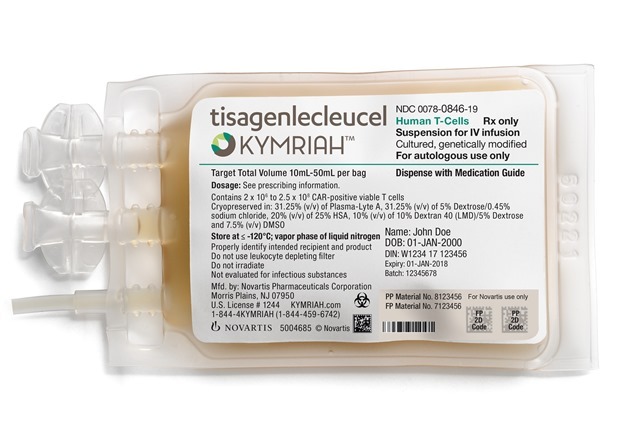 Kymriah (tisagenlecleucel) will be offered to people whose disease has not responded or those whose disease has relapsed after treatment with two or more courses of chemotherapy. Lymphomas are cancers of the lymphatic system which is part of the immune system. There were 11,690 new cases of non-Hodgkin lymphoma (NHL) in England in 2015 with 4,688 of these being diffuse large B-cell lymphoma. Meindert Boysen, Director of the Centre for Health Technology Evaluation at NICE, said: “Recommending another revolutionary CAR T-cell therapy for adults with lymphoma represents a step forward for personalised medicine. “We are pleased that patients are set to benefit from such an innovative therapy so rapidly because of joint working between NICE, NHS England and the company. “CAR T-cell therapy is expensive, however the treatment is specific to each individual and could be a potential cure for some, although it is early days. The list price for tisagenlecleucel is £282,000 and it is given as a single intravenous infusion. The company have agreed to offer the therapy at a confidential discounted price. It is estimated 200 people will be eligible for treatment each year in the UK and NHS England are working closely with several hospitals across the country to deliver this complex treatment. John Stewart, Director of Specialised Commissioning at NHS England, said: “The NHS has agreed another deal with the manufacturer Novartis which means that from next week more patients will benefit from this game changing treatment at even more hospitals throughout the country.